In Central Siberia, the character of taiga changes dramatically (Figure 9.6). The Central Siberian plateau and Sakha-Yakutia are distinguished by their extreme continentality and aridity. The mean January temperature decreases from -17°C in Krasnoyarsk (56°10'N; 93°00'E) to -43°C in Yakutsk (62°10'N; 129°50'E) while the annual precipitation total decreases from 410 mm to 200 mm. The Siberian anticyclone dominates the area throughout winter and, with little winter precipitation (34 mm and 21 mm, respectively), the depth of snow cover is small. In central Sakha-Yakutia it usually does not exceed 25-30 cm. Severe climate and the occurrence of continuous permafrost predispose the development of forests composed by the cold-resistant species (mainly Larix gmelinii) and poor floristic diversity (Figure 9.6). Dark taiga forests occur only in the westernmost regions of the Yenisey Ridge which attains the height of 800-1100 m and receives up to 550-700 mm precipitation. In the distribution of vegetation, zonality is poorly expressed in comparison with European territory and Western Siberia because of the continentality of climate and varied topography. 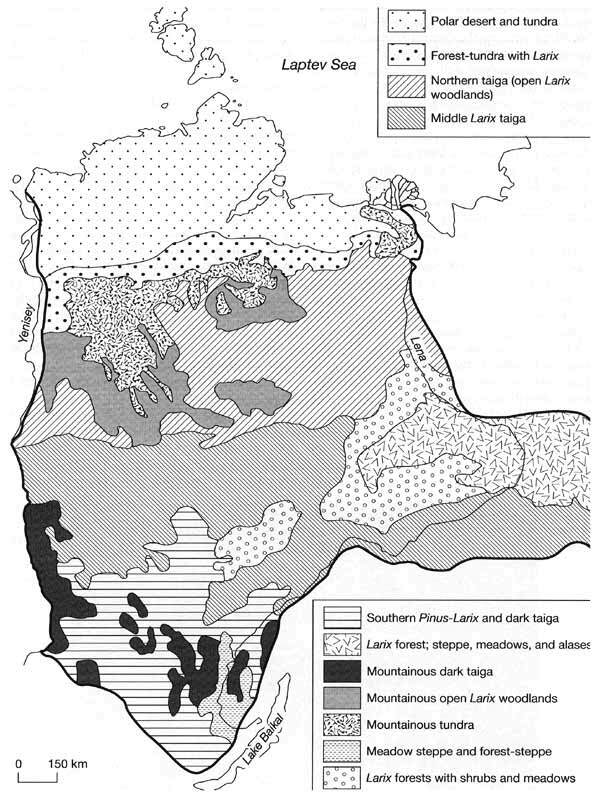 However, Central Siberia can be divided according to the vegetation cover into three parts: the northern subzone of sparse swampy forests; the central subzone of drier Larix forests; and the southern subzone dominated by Pinus sylvestris stands. In the northern regions of Central Siberia, open forests composed almost entirely of Larix gmelinii dominate. The canopy is low; at the age of 150 years trees are about 12m high. Phytomass reserves and productivity of forests decrease dramatically in comparison with the western regions. While phytomass reserves in the European Larix forests are on average 250 t ha-1 with the share of wood of 70 per cent, on the Central Siberian plateau they do not exceed 60 t ha-1 and 55 per cent (Bazilevich, 1993). Various associations with dwarf shrubs, such as Larix gmelinii-Ledum decumbens typical of the coldest sites, develop with either mosses or lichens. In the middle taiga, the composition of vegetation varies from west to east because continentality increases eastwards. Forests composed of Larix sibirica prevail in the moister western part which extends approximately to the Yenisey — Lena divide. The dark taiga species (Picea obovata and Finns sibirica) are relatively important. Frequent forest fires have recently led to a decline in the occurrence of Picea, which unlike fire-tolerant Larix, is easily damaged by fire. Fires occur once in 5-10 years in drier sites and once in 25-50 years in wetter places (Utkin, 1965). In the drier eastern part (Sakha-Yakutia) where permafrost occurs very close to the surface, Larix gmelinii dominates with the participation of Pinus sylvestris (especially on well-drained sandy podzolic soils). The shrub tier is represented by Betula exilis and Salix pyrolifolia while Vaccinium vitis-idaea is a typical dwarf shrub. The Larix-Vaccinium xerophilous forests are a typical zonal association occupying about 75 per cent of all forested lands in Central Siberia. In the Aldan valley, the Far Eastern species are found, such as Picea ajanensis and Atragene ochotensis. In the southern taiga, vegetation is more varied because of the higher diversity of climatic and soil conditions. Forests are composed of Pinus sylvestris in the west, Larix gmelinii in the east and the dark taiga along the high watersheds which have cool summers and ample precipitation. The main feature distinguishing the southern taiga is the absence of mosses and the development of rich herbaceous cover. It is represented mainly by sedges and up to 50-80 species may occur in a single association. The typical zonal association in the west is the Pinus sylvestris-Vaccinium vitis-idaea one and associations with Rhododendron dahuricum. These forests have high phytomass reserves of approximately 310 t ha-1 and the share of wood is over 75 per cent. However, because of the mature age of stands their productivity does not exceed 6 t ha-1a-1 (Bazilevich, 1993). In Sakha-Yakutia, aridity prevents the development of the southern taiga ecosystems and the middle taiga borders directly on the forest-steppe. The closest analogues of the southern taiga forests are Larix stands developing on the southern slopes of the Transbaikalian mountains, where in river valleys they are accompanied by Rhamnus dahurica and Mains baccata. Peculiar to the biome of larch forests in Sakha-Yakutia is the development of cryoarid steppes and steppified meadows. In the middle course of the Lena, treeless areas occupy substantial territories on terraces. Steppe species, which advanced to the region during dry, warm periods in the past, are well adapted to the modern climate with its small amounts of precipitation and high summer temperatures. Stipa spp. predominate and Festuca lenensis, Koekria gracilis, and xerophilous species, such as Veronica incana and Leontopodium sibiricum, are important. Dark-coloured fertile soils, which are very similar to chernozem in their contents of humus (12-14 per cent), nitrogen, phosphoric acid, and potassium develop under the steppe associations on loess deposits. Because of the permafrost, which occurs at a depth of approximately 80 cm, the composition of soils varies with season: in summer, when the active layer thaws, soil solutions rise upwards; in autumn, when rainfall is relatively abundant, salts are washed to the upper limits of permafrost. On the slopes, solonetz soils are typical while in topographical depressions patches of solonchaks with halophytes such as Artemisia jacutica, Salicornia europaea, and Suaeda maritima occur. Characteristic of the Yakutian forests are alases, closed treeless areas on which meadow vegetation develops (Plate 9.2). Their diameter ranges from a few hundred metres to a dozen kilometres. Alases form as a result of permafrost thawing. A small lake develops causing the collapse of soil around it which destroys forests. 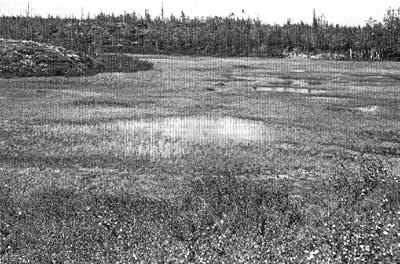 The centre of an alas is usually filled with water but around the lake meadow vegetation develops. About 40-50 per cent of the land surface in central Sakha-Yakutia is affected by alases. They are used as sources of fodder and provide pastures for cattle and a special breed of Yakutian horse which is able to graze in winter at very low temperatures.